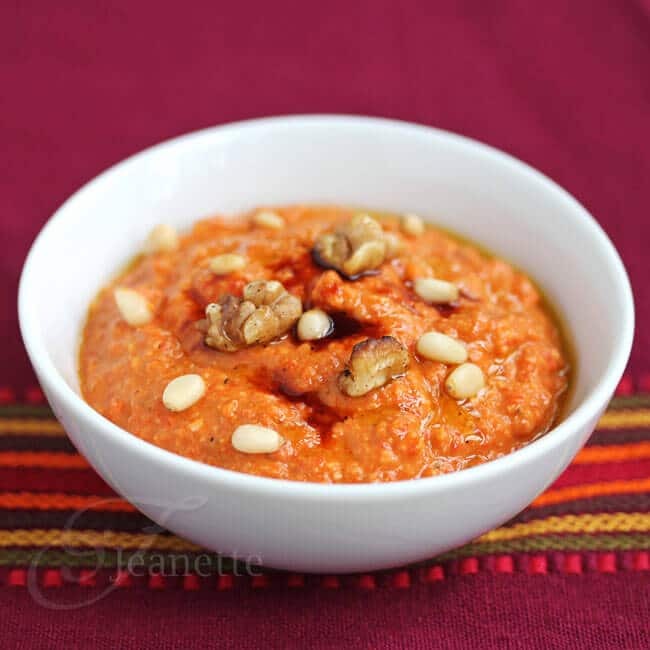 Muhammara is a roasted red pepper walnut dip that is perfect for dipping with vegetables or served with toasted pita bread. It is also delicious served on chicken and fish, or stirred into soups as a garnish. 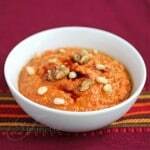 I first made Muhammara, a Middle Eastern roasted red pepper walnut dip four years ago. 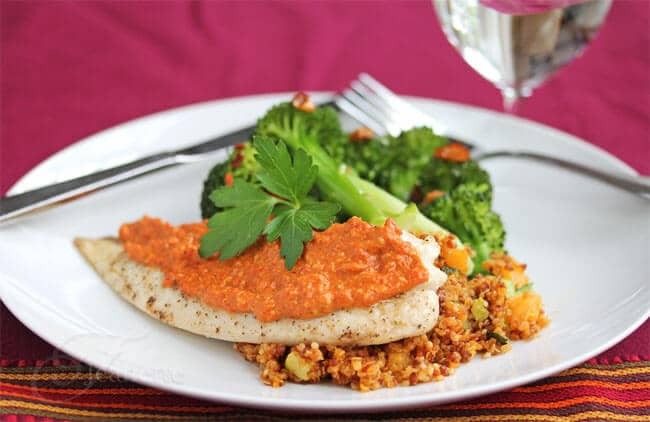 Muhammara originates from Aleppo, Syria, and is traditionally eaten as a dip with bread, as a spread for toast, and as a sauce for kebabs, grilled meats and fish. 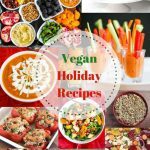 I’ve made several dips before using nuts, including Spanish romesco sauce, which is similar to muhammara but uses almonds, paprika and vinegar, and a few Georgian dips (Spinach Walnut and Eggplant Walnut). You can roast your own peppers or buy jarred ones. I like grilling mine because of the smoky flavor the peppers take on. Muhammara has a creamy feel to it from the walnuts and pine nuts, and is a combination of sweet, tart and smoky flavors from the roasted red peppers, pomegranate molasses and Aleppo pepper flakes. I could eat Muhammara by the spoonful by itself. In fact, I will confess that I ate a few spoonfuls before spreading it on top of some baked tilapia for my family’s dinner. Served with some Quinoa Pilaf and Steamed Broccoli with Toasted Garlic Olive Oil, dinner was ready in 30 minutes. I also packed a small container of this Muhammara to go along with the Creamy Roasted Cauliflower and Chestnut Soup I made for my friend with cancer. I thought it would make an otherwise plain looking soup pop with color and stimulate the tastebuds a bit. 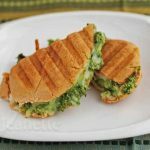 This version is gluten-free as I simply substituted bread ends from gluten-free bread that I ground up in the food processor. Muhammara keeps for about a week in the refrigerator. 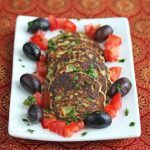 This is delicious served as part of a Mezze platter, or on top of grilled fish or chicken. Place roasted red peppers, chili flakes, walnuts, pine nuts, garlic, pomegranate molasses, cumin, lemon juice, bread crumbs and olive oil in a food processor. Pulse until combined, but still a little chunky. If you like it smooth, you can continue to process. Season to taste with salt. Transfer to serving dish, use a spoon to make a swirl and drizzle with a little more olive oil. If you're gluten-free, use gluten-free bread ends. What a fabulous dip, Jeanette! Great idea to serve it over fish, too. Great pic for SRC! The dip looks fantastic! Now that is a really interesting dip! I never would have though to use roasted red peppers for it. We are on quite a veggie kick so I will have to make this for my hubby!!! Thanks for a great SRC post!!! I’m visiting from Group D, and love what you did this month! Beautiful (AND delicious, I’m sure)! I want this on fish. Right now. Absolutely great! I’ve never had this sauce/dip, and remember placing a recipe on my computer a while ago. 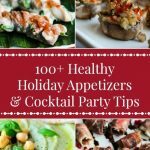 Yours go to Pinterest right away! I LOVE this! And I love your idea of having a collection of sauces to make easy weeknight dinners that are fabulous tasting! Thank you for sharing!!! Hi Jeanette! Thank you for so beautifully recreating my Muhammara. Yours looks delicious and very authentic! I love this dip! There is a middle eastern restaurant by my house that serves it with baby romaine leaves to scoop up the dip. Love that idea of using romaine leaves as scoops. Lovely post! Tagging to make later. Maybe for the next party. This is one of my favorite dishes that uses pomegranate molasses. 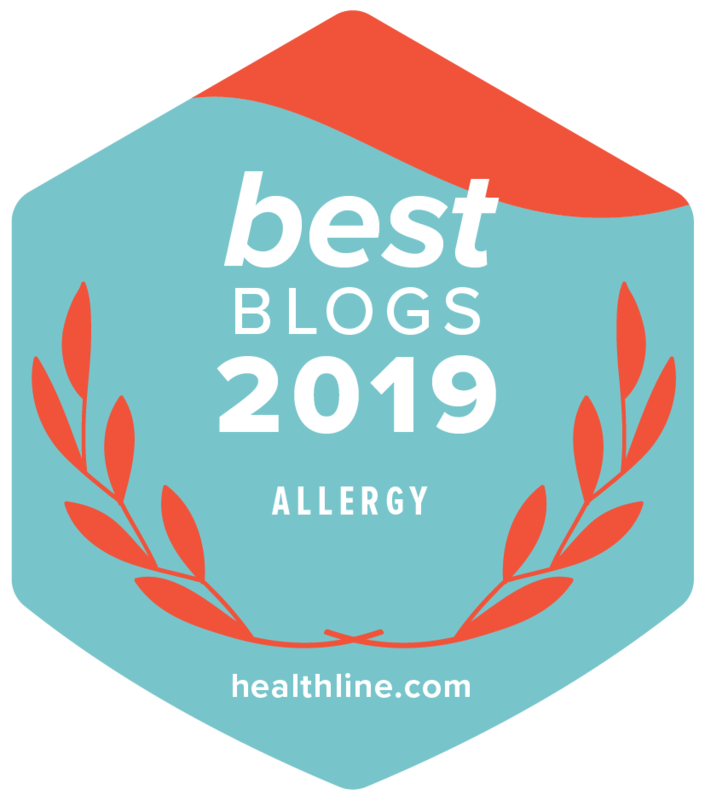 I love the idea of swirling muhammara into soup to perk it up; I’m going to try that! 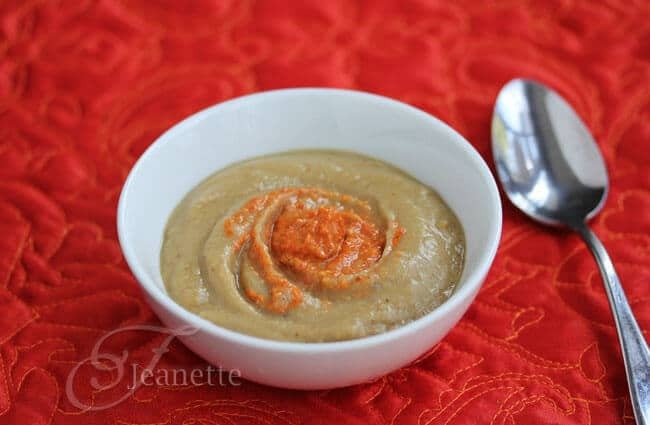 I love adding swirls like muhammara to pureed soups – adds some color and flavor for contrast. That dip/sauce looks so good! I have made the Spanish version several times with almonds and smoked paprika…I look forward to trying this version too since I am a huge fan of walnuts! 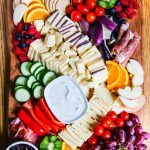 Gretchen and Kelly – I think you all would love this dip. 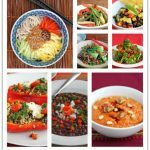 It’s so easy to make and goes with lots of different foods. What a stunning dip Jeanette! It sounds so versatile too. Great SRC post! I made this over the weekend to serve with lamb. Delicious. We used to eat for breakfast spread over a thick slice of bread when I was kid, in Turkey. It really goes with every meat I tried. this sounds wonderful + I love all the healthy aspects of it. i bet her baba ghanoush is great too – i might have to give that a try! deliciousness!!! 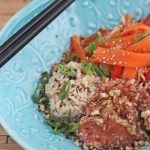 i make something similar with toasted cashews and roasted bell peppers! had no idea that there was an actual dip out there! 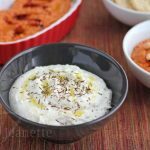 Junia, I do remember your dip made with cashews – nice combination too! 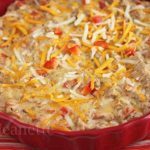 This dip is so so so good! try adding smoked paprika or chipoltli peppers for a smoky flavour! Great idea – I think a little smokiness would be perfect. I LOVE muhammara! 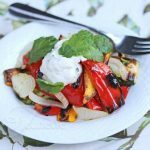 Anything with pomegranate molasses, actually, tends to rock my socks but there’s something about the smoky almost buttery roasted peppers paired with the tangy pom that is so addictive! I just know I’d be able to eat this by the spoonful. The pomegranate molasses sounds like it would add a beautiful depth to this simple sauce. we have a similar din in Romania, well, probably inherited from the Middle Eastern/ Mediterranean countries. Can’t wait to see some peppers at the farmers market to make your version. Isn’t it interesting how similar recipes can be from different countries. Would love to see your recipe from Romania. Brian – although I had used walnuts in basil pesto before, only recently have I started using it in sauces and other dips. It all started with a Georgian dinner I had in January and I have been fascinating ever since with the use of ground walnuts in all different types of dishes. I love Muhammara. Although the recipe I use has a teaspoon of cumin in it which works well. Des – cumin sounds like a nice addition, I’ll have to try that next time. Thanks for sharing.